Introduction - A previous post detailed the various equitable stroke control procedures (ESC) implemented by the United States Golf Association (USGA) over the past twenty years--See What Does the Equitable Stroke Control Procedure Mean for Golf? February 13, 2013. This post presents an analysis of the impact of different ESCs on handicaps and the overall equity of competition. A simulation model was used to estimate the effects of different ESCs on adjusted scores and handicaps. It was found that the latest ESC (ESC97) reduced the advantage of the low-handicap player over the high handicap player. This conclusion was affirmed in an empirical test using a small sample of players. Simulation Model - The first step in creating the simulation model was to estimate the probabilities of hole scores relative to par for golfers of varying ability. These probabilities were estimated first by drawing from a small sample of scorecards, and then reviewing and adjusting these estimates after discussions with numerous players. The results are dependent on these estimates. The overall conclusions of this analysis, however, were found to be fairly insensitive to moderate changes in the estimated probabilities. The probabilities for a low-handicap (5-handicap), a medium-handicap (15-handicap) and a high-handicap (25-handicap) are shown in Table 1. Each player had 1000 simulated rounds. His score was adjusted after each round under the three ESC formulas: 1) OLDESC, 2) ESC93, and 3) ESC97. The players’ average score and adjusted scores are presented in Table 2. As Table 2 shows, the adoption ESC93 lowered the adjusted score of the low-handicap player (.28 strokes), but raised the adjusted scores for the medium-handicap player (.95 strokes) and the high- handicap player (.93 strokes). After complaints by low-handicap players, ESC93 was dropped and ESC97 was adopted. (ESC93 limited the low-handicap player to a maximum of 6-strokes, while ESC97 allowed him to take a double bogey on any hole). This brought the low-handicap player back to where he was under the OLDESC. The low-handicap player, however, still lost approximately one-stroke vis-à-vis the medium and low handicap player. Handicaps were computed after each 20 rounds. The average handicap for each player under the three ESCs is shown in Table 3. Comparing handicaps under the OLDESC and ESC97, the low-handicap player lost approximately .6 stroke advantage in handicap to both the medium- and high-handicap player. One measure of over-all equity is the difference between a player’s average differential (average score - course rating of 70,0) and his handicap. These differences are shown in Table 4. The equations show the adoption of ESC97 decreased the penalty against the higher handicap player by 3 percentage points. Empirical Test - To test if the results of the simulation model are confirmed by real world results, a sample of 21 golfers was used. This sample was not random. It consisted of players known to the author and celebrity players such as John Paul Newport, golf columnist of the Wall Street Journal, George Peper, former editor of Golf Magazine, and Dean Knuth, former USGA Senior Director of Handicapping. The average differential ((score -course rating) x 113/Slope Rating) of each player was regressed against their index (2/15/2013) as shown in the figure below. (Note: If the ESC equations above are multplied by 113/Slope Rating, they become identical in form to the equation shown in the figure below). This empirical test shows the low-handicap player has a 9.5 percent edge as opposed to the 8 percent edge predicted by the theoretical model. Both the theoretical and empirical models, however, predict a smaller edge for the low handicap player than the 13 percent edge assumed in the development of the Slope Handicap System when OLDESC was in force. 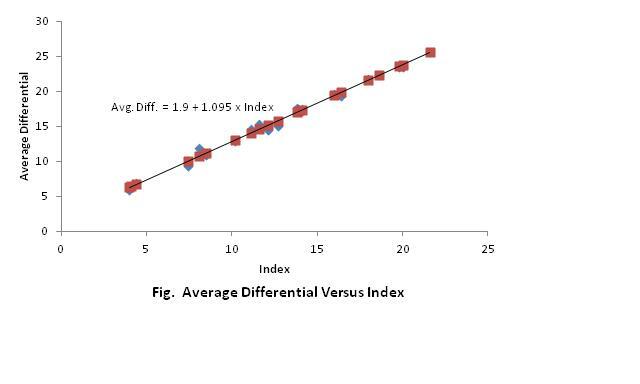 Clearly, the small sample size limits the confidence in the estimate of the coefficient (i.e., .095). Since ESC97 increased the cap on scoring for medium- and high-handicapper players, a reduction in the edge given to the low-handicap player was inevitable. Therefore, it is reasonable to conclude ESC97, as opposed to OLDESC, made competition more equitable, but not equitable. How golfers have reacted to this inequity will be the subject of a forthcoming post--In Defense of Sandbagging. These equations were determined by finding the trendline among three data points.